Jeju does many things exceptionally well, and waterfalls are just one of them. 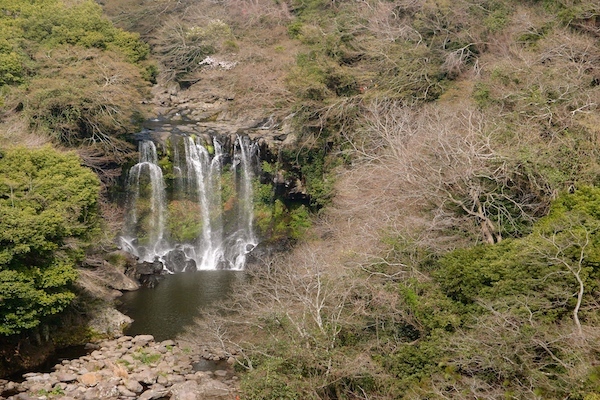 There are four popular waterfalls in the Seogwipo area. They will most certainly be filed with tourists in the summer months, but if you go during the off-season or very early in the morning, you might luck out and hit less walking traffic. Jungbang and Cheonjeyeon are right on the coast in central Seogwipo, and signs will easily direct you to the entrances. Cheonjiyeon is in the Jungmun Tourist Complex, a 15 minute drive west of Seogwipo on the 1132; the 600 and 780 bus from Seogwipo will also drop you in the complex. This area is home to all the major resorts, meaning that there are signs for anything and everything that you’ll need. The falls are right next to the Yeomiji Botanical Gardens. This is one of my favorite places on the whole of the island. For 9,000won, you can take a stroll through Korean, Japanese, French, and Italian-themed gardens, before walking across a flowered meadow and into a glass bio-dome; really, it’s a series of separate biodomes with exotic plants under a single roof. From the top of the glass dome, you can take in a gorgeous view of Jungmun, the sea, and Hallasan (the tallest mountain in Korea) behind you. 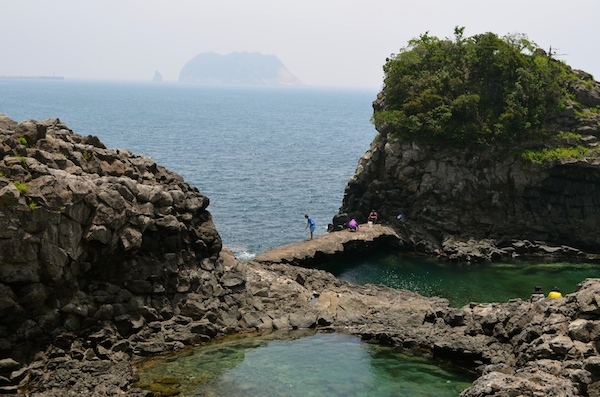 Oedolgae is one of the more famous rocky cliff sites in the Seogwipo area. From the cliffs, you can gaze out at Oedolgae rock, piercing through the surface of the sea and acting as a beautiful addition to any sunset. From the parking lot, you can find a staircase that descends to a few great swimming holes, perfect for snorkeling, cliff jumping, or a quick dip in the sea. It also sits directly on the junction of the Olle Trails six, seven, and seven-one, making it an ideal spot to begin or finish a trek. Follow Taepyeong-ro west for about two kilometers, past Geolmae Eco Park, and you will see signs. The 780 and other local buses will take you there, but walking or taking a cab is probably more time efficient. 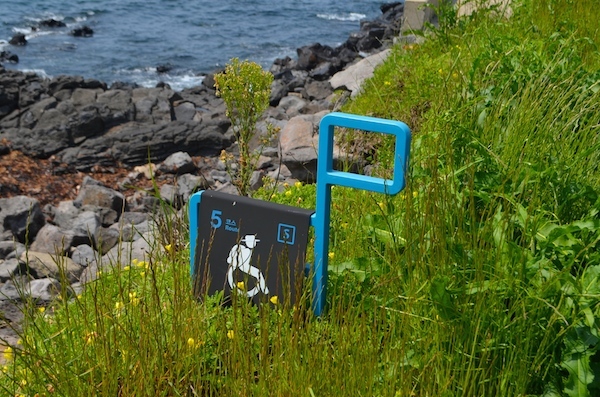 Hiking an Olle Trail (or several) is a great way to experience the natural beauty of Jeju. There are more than 20 of them, with four passing through in Seogwipo (5, 6, 7, and 7-1). The trails are typically not very difficult and are considered more of long (19ish kilometers) walking trails than hiking, but there are several points that get steep and require some athletic maneuvering. Jejuolle.org is a great site that allows you to explore the different routes, get information on the terrain, and find out how to get to the starting points. The wooded area at Donnaeko is a beautiful area a few kilometers inland. 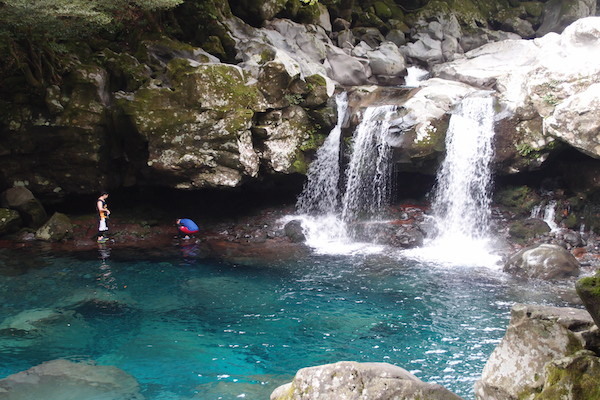 Here, visitors can hike part of Hallasan, picnic, camp, and climb down to the peaceful waterfall and swimming hole. Be forewarned: that mountain water is icy cold, so swim with caution. To get there, take the 1131 north until you hit Donnaeko-ro – there will be signs to turn left. A cab will cost you 5,000won at most, but the 780 bus from Jungang Rotary or Dongmun Rotary will also get you there. 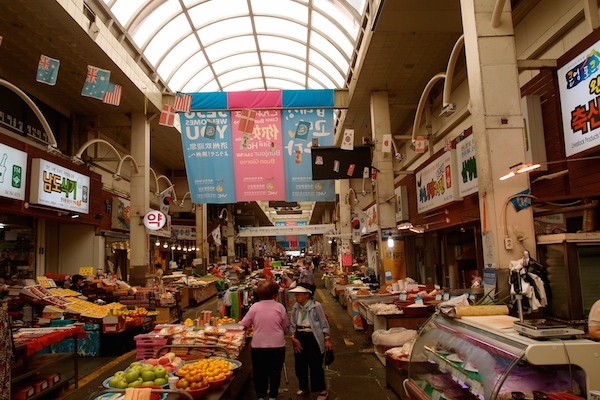 Since Seogwipo is essentially surrounded by farms, it comes as no shock that it would have great farmers markets. In the center of the city, on the Olle six, sits the Every Day Market (Mae-il shi-jang). Here, you can stroll the corridors and taste fruits and Korean street food made in front of you. If you’re visiting the city on a date ending in 4 or 9, you’re in luck. On these days, the Five Day Village Market is held. In this large open market, you will find everything from produce and clothing to animals and crafts. It’s great to walk around for a few hours and get a sense of what the rural scene is all about- a truly authentic old-school “market day”. The Five Day market is in the east of the city on the 1136, so you can take any bus that runs along that road or take a 3,000won (max.) cab. Again, there is a big sign and an arch on your left- you can’t miss it. For most places in Seogwipo, it’s best to take a cheap taxi or take the 780 bus. The local buses can be confusing, as there are rarely any maps at the stops. To get to more remote areas, go to the Seogwipo Intercity Bus Terminal, located next to EMart on the 1132, just 3 km west of the city center. There you will find a comprehensive map of the island and all the routes. There is also a small terminal in the city center (Jungang Rotary). Saying, “Bus terminal?” will get you down the right side street. You can also use bus.jeju.go.kr, but it is only completely compatible with Internet Explorer. Hailing from Detroit, Michigan, Leah lived a very average American life. A few years ago, she quit her job and her life in search of something that made her feel alive. Her passion for travel flourished while hitchhiking, cycling, and rafting around Europe. After some major life changes and a new free-spirited outlook, she became determined to be a, “Yes” person and to experience all that this crazy amazing world has to offer. 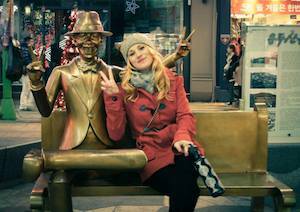 She now shares her adventures and culinary experiences on her website, www.thevegetariantraveller.com. Leah is currently teaching English on Jeju Island and is planning to hit the road again in November 2014. Four Abandoned Places on Jeju Island You Didn’t Know Existed. This entry was posted in Jeju Island, Jeju-do, Korean Cooking Classes and tagged best places to visit in korea, jeju attractions, Jeju Island, jeju island attractions, jeju things to do, korea tourism, places to visit in korea, places to visit in south korea, south korea tourism, things to do in jeju, visit korea, what to do in jeju by Meagan & Dave | HappilyEverExpat.com. Bookmark the permalink. Love you too, Mom! Can’t wait to see you in Korea in just two short weeks. I loved Jeju so much that I went twice and I’d love to get back for a third time! If you have any questions about Jeju or want more ideas for your trip, definitely check out Leah’s blog. I haven’t started to do any research on Jeju, as I won’t head there until my contract is up in April, but this I am definitely favoriting this post. It’s so detailed about how to get places! The Olle Trails sound like something I would love to do. Thanks for the tips! No problem. You’ll love Jeju. I’ve been twice and really enjoyed it both times. There’s really so much to do there so it’s a good idea to try to plan ahead as much as possible so you don’t miss any of the really good stuff! I love Jeju and have been once before but I never saw / did any of these things! The more I read about it the more I realize I HAVE to go back! I’m right there with you. I haven’t done a lot of them either. 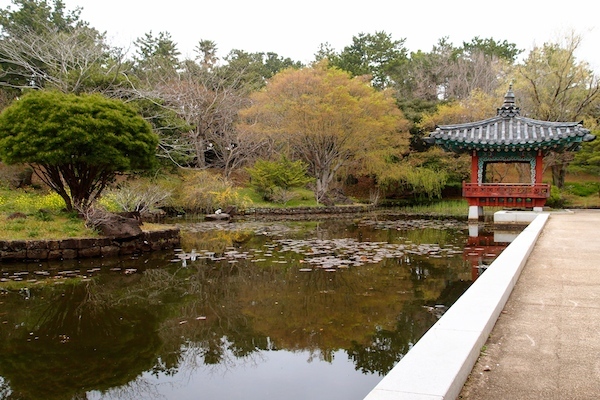 This post by Leah really makes me want to get back to Jeju! Jeju is a really awesome place to visit. I hope you make the trip there. It’s well worth it! Whoever thought of “The Olle Trails” was a genius! I loved walking along the paths, keeping an eye out for the ribbon marking the way. There is something magical about Jeju, and I think the Olle Trails really embody the beauty of the island. The more people rave about the Olle Trails, the more disappointed I get that we didn’t do them. I think we are going to try to plan another trip to Jeju before we leave Korea next spring so I’ll have to make sure we do them then. Out of the two sides, Seogwipo was definitely my favorite on Jeju-do. And it seems like I missed out on a couple of things. Olle Tail looks like a plan for the next time. Great list! Seogwipo is definitely my favorite too. I’m bummed we didn’t do the Olle Trails when we were there either. Gahh I’ve been wanting to go to Jeju since I came to Korea and here I am, a year and a half later approaching the cold season.. Any advice on times to go from now until March? This list is great, there’s so much more than just Hallasan, which was the main thing I wanted to see before. Thanks for more bucket list items! Great post Leah! Most of these have been checked off my bucketlist already. I’ll be starting on the Olleh Trails this autumn season. Sounds fun! Let me know you go! I’ve been here a year and a half(ish) and there are still so many sites I am yet to see…in fact this brought it closer to home! I will have to revisit Jeju in fact, as I missed some of these! Great post! Great blog. My name is Leah, too, and I’m a vegetarian teaching English in South Korea. Would you say Seogwipo is a better stay than Jeju-si? Can you recommend any vegetarian friendly places my travel partner and I can check out? I prefer to stay in Seogwipo, but that’s just my personal preference. I think you can have a good time staying on either side of the island. As for vegetarian places, any bibimbap place or kimbap if you can explain that you don’t want the crab. I’m not sure of any specific vegetarian restaurants. If you go to a large temple around lunch time a lot of them serve lunch for free to the public and those meals will be vegetarian.